An Appeals Court in Accra has dismissed a motion filled by the counsel for the fifth defendants, the Ghana National Association of Farmers & Fisherfolk (GNAFF) for a stay of proceedings. 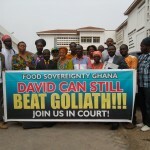 Food Sovereignty Ghana (FSG) appeared before the Appeal Court today March 28th to hear a motion brought forward by the Ghana National Association of Farmers & Fisherfolk (GNAFF) to effect a stay of proceedings in the Human Rights High Court concerning the case against the commercial release of GM cowpeas and GM rice, initiated on November 23, 2017 by FSG. It would be recalled that the case, Food Sovereignty Ghana & 3 ors Vs National Biosafety Committee & 4 ors, was called on Monday March 19, 2018. This was meant to continue with proceedings in the case originally brought before it on November 23, 2017 to begin trial of the substantive issues in the case, as the case has seen some three years without action. The 5th Defendant stated at the Court of Appeal that an earlier interlocutory ruling has technically ended the GMO suit and when so declared at the appeal, the matter ends. And prayed for an order for stay of proceedings to be granted for the High Court to stop hearing the suit. In a passionate delivery, Plaintiffs Counsel, Lawyer Tetteh Wayoe, opposed on the solid ground that NOT ALL reliefs raised were determined by the interlocutory ruling so the matter is not determined by that ruling! He also sought damages of five thousand cedis from the GNAFF however the court eventually awarded FSG damages of two thousand cedis. The court ruled dismissing the motion and cited the fact that there was no special circumstance that had arisen for such a stay to be granted. The court found no grounds in GNAFF’s assertion that the ruling on the 2015 injunction had determined the entire suit. The court recognized that other reliefs had been sought by the plaintiffs which were still outstanding for determination in the High Court as prayed by Plaintiffs counsel. The parties are to return to Human Rights High Court of Accra on April 13th at 11 am for the issues raised by the parties to be set down for trial in this historic and landmark case concerning biotechnology in Ghana.